The short version of this week’s service-academy football slate: Two schools square off to begin the quest for the Commander in Chief’s Trophy, and the other could play in front of more than 100,000 people. 1. Muddy track in Annapolis. Navy’s a six-point favorite hosting Air Force on what could be a soggy Saturday afternoon — nearby Maryland has already moved its Saturday game against Big Ten rival Michigan from 8 p.m. to noon to escape the damage that could be wrought by Hurricane Joaquin. No change yet to the Mids-Falcons kickoff, set for 3:30 p.m. (CBS Sports Network). Bill Wagner of the Capital Gazette details Navy’s bad-weather prep work here. 2. Reynolds vs. record. Navy quarterback Keenan Reynolds enters Saturday’s game with 73 rushing touchdowns, four shy of tying the NCAA career mark. His first score came against Air Force in 2012, a 15-yard run that pulled Navy within two points in the fourth quarter. The Mids made the two-point conversion to tie the game at 21, then won in overtime when Jake Zuzek recovered Reynolds’ fumble in the Falcons’ end zone. The Navy signal-caller hasn’t always been so lucky against Air Force. Last year, the Falcons held him to 27 yards on 21 carries en route to a 30-21 victory. This year, the Air Force defense could get a boost from the return of Gavin McHenry, a senior cornerback who is back in good standing after a suspension, according to the Colorado Springs Gazette. 3. Spirit spot rout. Our friends at Flightlines had it first, but check out Navy senior Rylan Tuohy’s video smackdown of the Air Force below. Tuohy’s no stranger to spirit spots, although his recent video poking fun at the U.S. Military Academy’s pillow-fighting debacle didn’t last long. 5. Happy Valley visitors. Like many Army West Point football stories, this one gets worse when the film moves from black-and-white to color: The Black Knights haven’t beaten Penn State on any field since a 1966 win at West Point and have lost nine straight in the series. The teams haven’t met since 1979; the sellout crowd expected at State College could top 100,000 fans, though the expected bad weather may thin the herd a bit. Army West Point starting quarterback Ahmad Bradshaw may not play thanks to an ankle injury, and Penn State’s defense is 14th in the country against the run — Army West Point’s primary mode of attack — allowing about 90 yards a game. All that adds up to the Nittany Lions entering the game as 24-point favorites. 6. Quick links. At Task and Purpose, Navy grad Joe Ruzicka explains why the Navy-Air Force rivalry has Army-Navy beat. … Scheduling rules could make it easier for Army West Point to line up dates with Big Ten foes. … Air Force’s Oct. 10 home game against Wyoming finds a home on ESPN2. 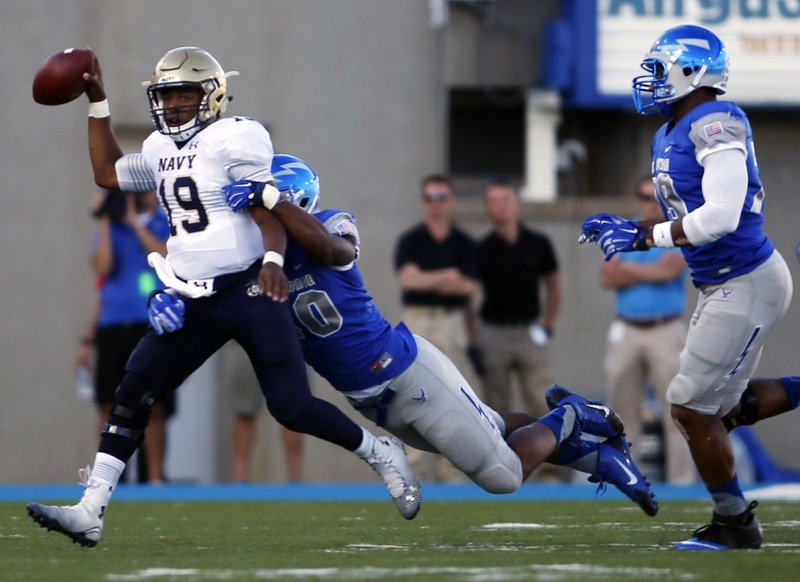 … Blogger CDR Salamander’s take on the baggage big-time college football brings to service academies, Navy in particular, may not be the best way to get your pregame fandom flowing, but it’s a must-read piece on an ever-present debate.